Last week we offered guidelines and suggestions forwriting a great website timeline. This week, CorporateHistory.net looks at the timeline on the website of Pepsico, a corporation that has plentiful resources and more than a century of company history. 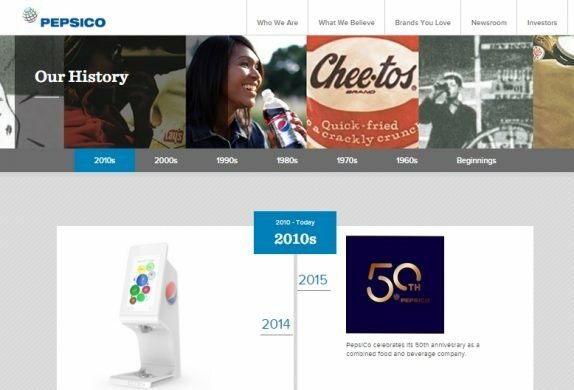 Sadly, Pepsico’s timeline isn’t spectacular. Pepsi’s timeline is a single series of dates and events, with the most recent date at the top. A tab option at the top allows readers to skip from decade to decade. Kudos to Pepsi’s designer for the layout, which is simple and elegant. The font for the years is easy to read, and a vertical line indicates the direction of the time flow. More kudos for the well-chosen and plentiful images. Of the 70 or so entries, 28 have illustrations. Unfortunately, the text of the entries is subpar. We have no clue which of the 70-odd events are most important in Pepsi’s corporate history. For example, the inauguration of the first Pepsi-Cola operation in China (1982) is immediately followed by Frito-Lay’s introduction of Tostitos (1981). Given this mix of topics, we don’t even know whether the timeline is aimed at consumers or potential investors. But much worse comes (or doesn’t) at the end of the timeline. Pepsi was founded in the 1890s, but the company history from then until 1966 is summarized in one very short paragraph. Most of that paragraph consists of names of CEOs, rather than storytelling. There’s not a single image. What a waste of a great history! If people have been loving your product for over a century, why not flaunt that fact with vintage ads, logos, and photos?